We have arrived in Florida, and my parents are busy cleaning out the camper and other odds and ends, so I thought I would do a post! 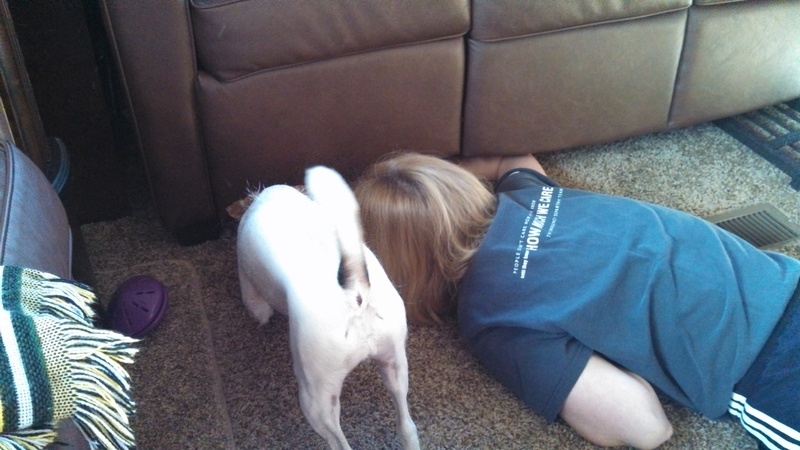 My mom looked under the couch to see what I was staring at, but didn’t see anything. 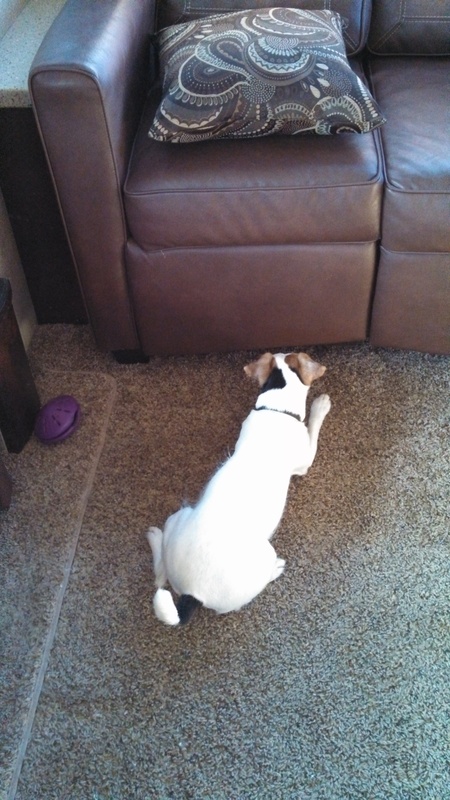 But I kept whining, so she got a flashlight and looked under the couch again. I helped point out where my treat was. My dad remembered that the couch folds forward (it folds into an air mattress I guess), so they were able to reach my treat, and all was well with the world again! For awhile, that is. Then I kept hearing voices, familiar voices, but I couldn’t figure out where they were coming from. 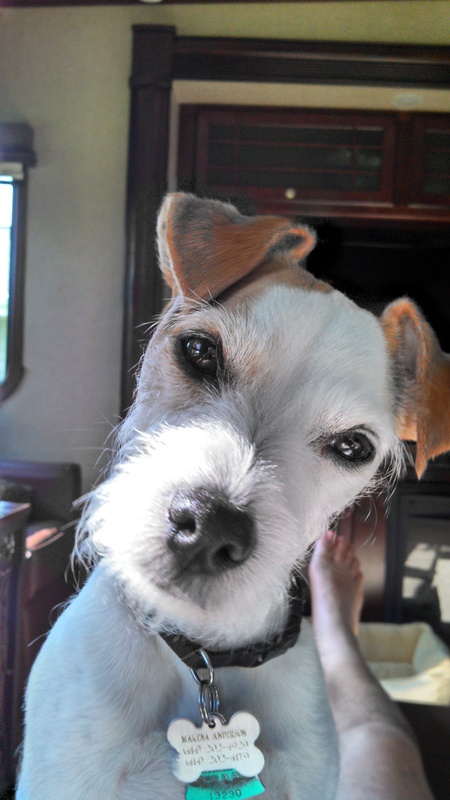 I would run around the camper, barking, and then I would hear laughter from those familiar voices. I asked my mom if this is why people go get a CAT scan? She tried to explain that those voices were from the Face Time and Skype that they were doing with our families for the holidays! I’m a dog, I don’t understand all this new technology stuff, but I know they both appreciated being able to see and talk with their family (even if Skype turned my mom’s family into purple and green blobs!!). Other than that, I am really starting to enjoy this camper life. We have been on the move a few times in the past week. I know that when I get out of the crate in the truck, I am always at home. Same bed, same location for my treats and dog food, just a different view. I am really settling in nicely, and am enjoying the sunshine along with warmer weather! I hope all is well for everyone out there! I think my parents will start posting again when they get to Cedar Key. If not, I will keep you updated! We would like to wish everyone a very Merry Christmas! 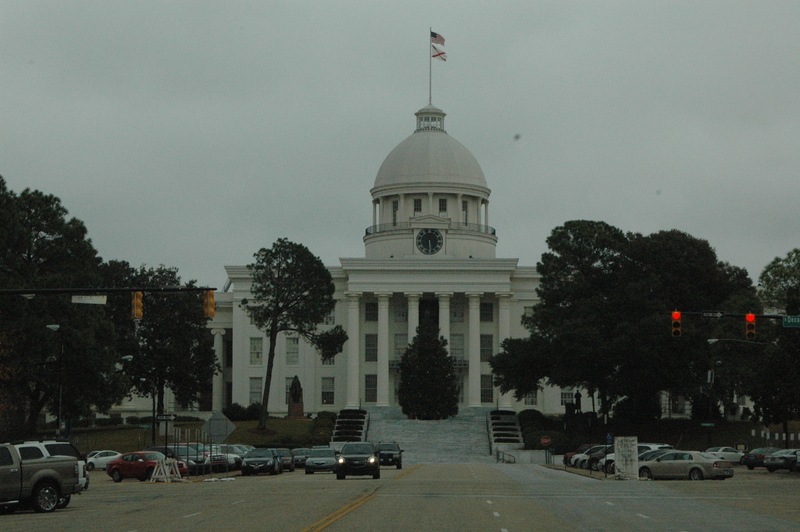 We decided to stay in Montgomery until tomorrow, when we will leave for sunny Florida. We miss seeing our family and friends this holiday season, but everyone is welcome to join us in Florida!! 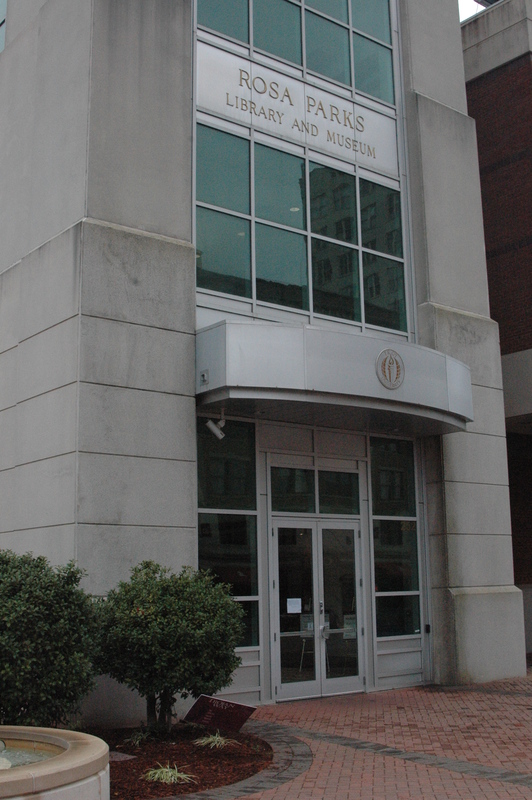 “Women who behave rarely make history” is the slogan at the Rosa Parks Library and Museum, in downtown Montgomery, AL on the Troy University campus. On Monday we visited the museum honoring Ms. Parks, known as the mother of the Civil Rights Movement. Photographs are not allowed inside the museum. It contains a visual re-enactment of the historic day, as well as many documents, photographs, memorabilia from the era. The bus system in Montgomery was segregated. African-Americans would enter the front of the bus, put in the fare, exit the bus, then walk to the back of the bus and re-enter. All the while praying the bus driver did not take off, which happened on many occasions. On December 1, 1955, 42-year-old Parks boarded the bus on her way home from work. By law, the first 10 seats of the bus were reserved for whites, and Ms. Parks sat in the row behind those. The bus was very crowded, standing room only, and when the bus driver noticed a white man standing, he stopped the bus and ordered Ms. Parks and 3 other African-Americans to vacate their seats. Ms. Parks quietly refused, and the bus driver contacted the police and had her arrested. Her case went to trial on December 5, where she was found guilty and fined for disorderly conduct. This was despite that fact she was not in violation of the law, as she was not sitting in a “white only” area. After her arrest, thousands of flyers were distributed by the Women’s Political Council of Montgomery, requesting a boycott of the bus system on December 5. 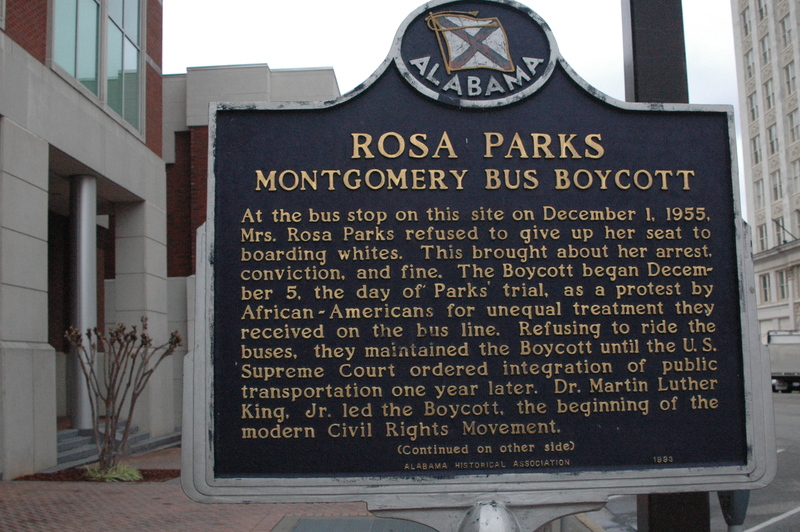 At the same time, a group of ministers and local activists formed the Montgomery Improvement Association (MIA) and decided they needed to continue boycotting the bus system. The elected a new minister to Montgomery, Martin Luther King, Jr., as president of the MIA. Dr. King advocated non-violent protests, and they organized car pools so citizens would be able to continue getting to their jobs. The MIA met numerous times with the mayor and city bus officials, to work out a resolution. They were not seeking to overturn segregation of the bus system, they just wanted fair treatment. The museum displays many copies of documents and petitions they filed that were repeatedly turned down. The bus company was losing $3,000.00 a day as a result of the boycott, a substantial sum in 1955. So the bus company raised fares, which kept even more riders off the buses. The boycott lasted 381 days, and did not end until the US Supreme Court ruled that the bus segregation law was unconstitutional, and the buses were integrated in late December of 1956. But it was only the busses. The bus stops remained segregated. The museum does not contain the actual bus involved, as that is on display in the Henry Ford Museum. 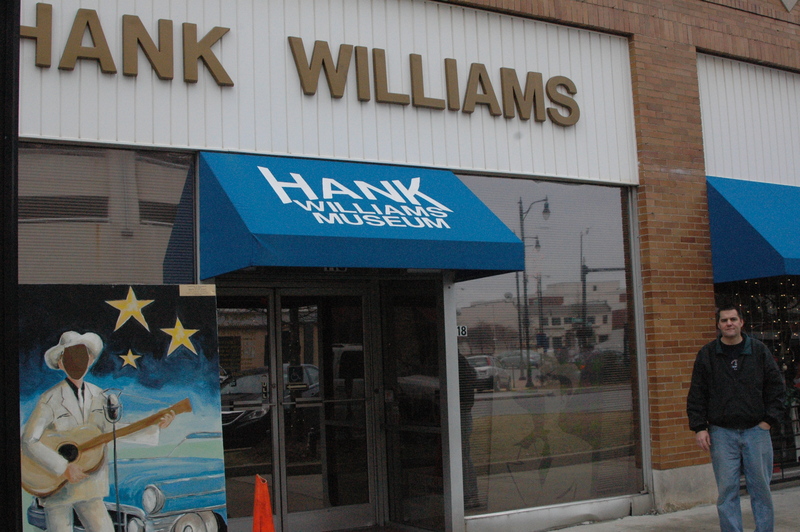 After that, we were going to go to the Hank Williams museum, but that was closed at the time. We stopped at Sam’s Club on the way back to the campground. Alabama charges a hefty 10% state sales tax, even on grocery items!!! If you are going to be visiting this state, stock up on groceries before you get here!! Greetings from stormy Montgomery, Alabama! Yesterday (Saturday) was our last day of work at Amazon. After 3 months it was time for hugs and “see you later”. I don’t do “goodbye” anymore….too sad for me. We really enjoyed our time at Amazon, as we met lot’s of wonderful people and learned so much on how to live our dream of full-time RV’ing. It is a good community to belong to. On our last day, the Camperforce team was having a final meeting at 3:00pm. Normally we work until 5:00pm. About 2:40pm, I noticed dozens of smiling folks in their Camperforce t-shirts heading towards the break room for the meeting. So I logged out of my scanner, put my last tote on the conveyor, and joined the parade of happy people! Dan joined a few minutes later. They thanked us again for working for them, and we received a t-shirt and some bags of M&M’s! Then it was back to the campground, where we prepared for our Sunday morning departure. We had 2 routes planned, as there were storms and high wind advisory’s in effect. In the morning we decided to head south thru TN and AL, as it looked like the storm would be going thru Atlanta. We had perfect weather until we were about 30 miles from Montgomery, AL. It has been raining like crazy since we arrived. Makena is hiding somewhere, as there has been a few booms of thunder. We weren’t too happy with the rain, but then my sister and my friend Amy sent photos of the snow that was falling back home in Wisconsin. Yes, we will deal with the rain and 55 degrees! We plan on staying here for 2 nights, and may go out and play tourist in the Montgomery area tomorrow. After that, we have not decided where we will end up. We were hoping to be able to watch the Packers/Steelers game, but they have the Patriots/Ravens game on tv here. Oh well, it’s better than People’s Court, Divorce Court, America’s Court and Paternity Court that we had endless episodes of in Kentucky on our single channel. And now for what many have been waiting for…..the final weight loss totals!! Despite eating more (a lot more!!!) 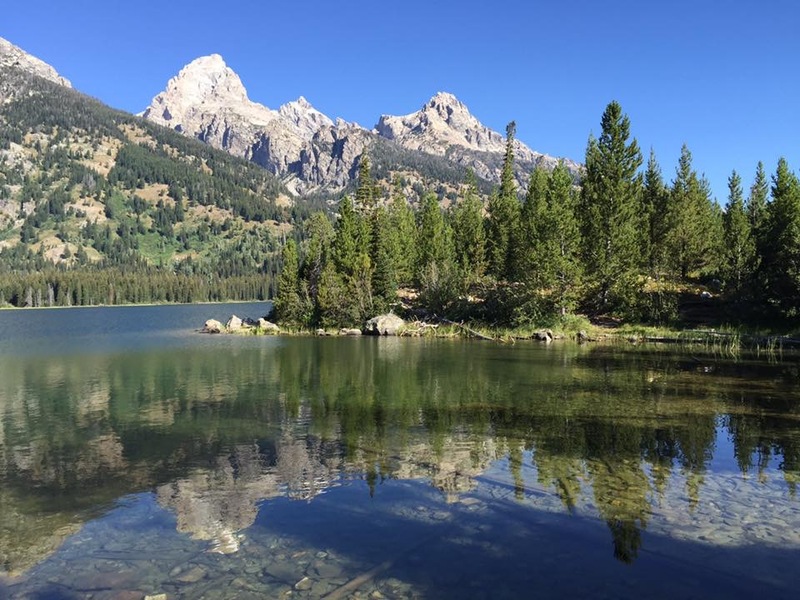 I ended up losing 8 pounds and 5% body fat in the 12 weeks that we were working at Amazon. But the “biggest loser” was Dan. He weighed himself this morning, and said he lost at least 20 pounds!!!! Woo-hooo!!! (he won’t give a specific number). Makena said she plans on making sure we do plenty of walking with her, so we don’t gain back the weight!! Monday night we received an e-mail from Amazon with our end dates, by shift, for the workcampers. The end dates are spread over 3 days, depending on your shift. Our final day is Saturday, December 21. We are the last of the groups to go, and we are happy that we will work until Saturday, as it will give us 20 hours of overtime this week. Tomorrow (Thursday) is our off day. We plan on getting everything ready for our departure on Sunday. Amazon pays for 1 extra day on your campsite, so people do not have to leave right after working 10 hours. As to where we will end up Sunday night, we are leaving our options open. We can’t get in to the campground in Cedar Key, FL until January 2, so we have a week or so to wander around down south. 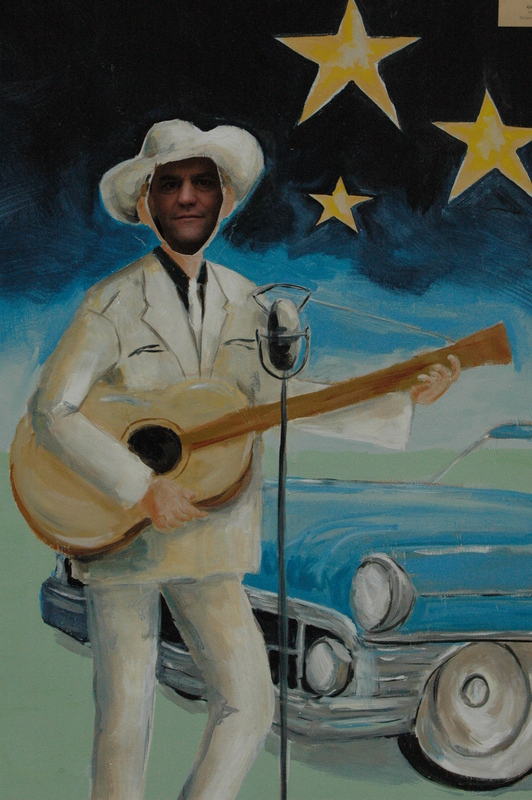 We have several campgrounds picked out in Alabama. It will just depend on the weather and how tired we are. We are even hoping we can watch a bit of the Packers game on Sunday. It has been a pretty busy week at work, and they are always having contests every day in picking. We have both won multiple gift cards for Kroger grocery store, Subway and Domino’s. In addition, the vending service had prepared a chili and bake potato lunch for us on Sunday. Candy canes were handed out on Monday, and yesterday Amazon had soft pretzels and cheese for the afternoon break. They also had an attendance drawing for the workcampers. One person won a Kindle Fire HD, and 9 others won Amazon gift cards. Only 20 more hours of work!! (My feet will be happy, as they are getting a little worn out from all the walking). Actually 18 hours, as we have a “release party” on our last day starting at 3:00pm. But we will be paid for the full shift. Not really sure what they will do at the release party, so I will let you know. We have already submitted our exit interview. This was the first year they gave the questionnaire ahead of time to the campers. I am sure they will get more thoughtful comments as a result. Makena keeps running towards the truck when we let her outside. I think she is getting anxious to move on as well! !